Indulge in the absolute guilt free divinity of rich, creamy and smooth milk chocolate enrobed on select hand picked Blueberries and Cranberries, overloaded with brain boosting elements, creating a combination of health and exquisite taste, while you embrace the natural zero calorie sweetness of Stevia plant. It'll leave you craving for more, we promise!! Ideal for the health conscious and chocolate connoisseurs. Key ingredients/Composition Unsweetened Belgian Cocoa, cocoa butter, full cream milk powder, cranberry, blueberry, stevia extracts, erythritol,maltitol, emulsifier Lecithin (E-322). Contains added natural Vanilla flavor. We do not add sugar or artificial sweeteners. Safety information/Caution : Keep in cool dry place away from sunlight. Indulge in the absolute guilt free divinity of rich, creamy and smooth milk chocolate enrobed on select hand picked Blueberries and Cranberries, overloaded with brain boosting elements, creating a combination of health and exquisite taste, while you embrace the natural zero calorie sweetness of Stevia plant. It'll leave you craving for more, we promise!! Ideal for the health conscious and chocolate connoisseurs. 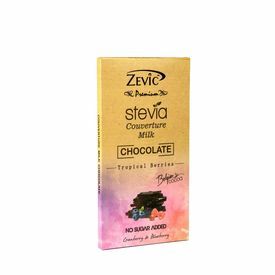 Key ingredients/Composition Unsweetened Belgian Cocoa, cocoa butter, full cream milk powder, cranberry, blueberry, stevia extracts, erythritol,maltitol, emulsifier Lecithin (E-322). Contains added natural Vanilla flavor. We do not add sugar or artificial sweeteners. Safety information/Caution : Keep in cool dry place away from sunlight.